Stephen Fedore was a 2012 EP Fellow and now, he’s the Chief Analytics Officer at Tulsa Public Schools—an on-the-rise district serving approximately 42,000 students in 86 schools with roughly 7,000 employees. EP is expanding to Tulsa in 2018 where EP Alums Martin Green, Director of Academic Services and Impact (2014 Fellow); Quentin Liggins, Director of Talent Initiatives (2016 Fellow); and Stephen are already working at Tulsa Public Schools. Stephen was born in Oklahoma, but grew up in California. He never thought he would return to Oklahoma to make a life and career in Tulsa, but he’s thrilled he did. Find out why in this Q&A with Stephen in which he discusses Tulsa as a unique place for young professionals who want to make a different right out of the gate. You were born in Oklahoma, but didn’t expect to return there for your career. Now, you have made Tulsa your home. What changed? Though I was born in Oklahoma, I had only spent roughly 24-36 hours in Tulsa before working at Tulsa Public Schools. I started at TPS through Harvard’s Strategic Data Project and came with the assumption that I can do anything for two years. But, I quickly realized that Tulsa is an exciting place with limitless opportunities. What can a young professional expect in Tulsa in terms of the ability to make an impact? I found that a young professional has an opportunity to immediately make a big difference. This is evident in having the opportunity to take a senior level position at an early stage in my career.. That doesn’t often happen in other cities where entrenched politics and a surplus of technical talent make it difficult to be noticed. Tulsa is hungry for talent and you can be a big fish in a small pond. You are noticed here. Your work will be used and decisions made based off of it. The credit isn’t taken by anyone else but you. There is a lot of buzz around Tulsa as an up-and-coming district with newer leadership. What is unique about this point in time in Tulsa Public Schools? Tulsa Public Schools is in the midst of radical change at the district level, which is wonderful. For example, in my department which we call the Analytics Lab, we’re incredibly collaborative and focused on school site support. We prioritize our projects on one critical litmus test: is it going to improve the life of a teacher or principal? That nature of collaboration extends from the district to the city-level. The superintendent works in alignment with the city and the mayor. TPS works very closely with a number of agencies and a well-funded philanthropic community with a shared focused on improving student outcomes.What are the challenges and opportunities in the Tulsa education space? Low teacher pay is a big challenge in Oklahoma. We continue to work on the policy side and support efforts for statewide change, but we can’t directly impact that change. More directly, there is a significant opportunity for Tulsa to impact early grade reading. This is where we are starting to see early wins based on our dedicated focus. Classrooms have significantly increased their usage of quality texts. NWEA MAP scores in students reaching reading proficiency by third grade have increased four percentage points. Another area for growth is turning TPS into a 21st-century school district of service and support. Right now, the majority of teachers and principals don’t feel like they are receiving support and services based on data. We, as a district, are rethinking how we can provide those services. The primary way we are attacking this challenge is by providing timely data in an intuitive format that is accessible 24/7 from a computer, phone, or tablet. We want teachers and school leaders to be able to see insights quickly and not have to spend hours analyzing data when they could be using that time to support students in a more direct and informed way. Where can EP Fellows make the most difference in Tulsa? Though it depends on their skill sets and backgrounds, in a broad perspective, they can have an impact anywhere that they are extremely passionate, open to learning and taking risks, and ready to work hard. There is no shortage of opportunities to make critical decisions in Tulsa as a Fellow—even early on in the Fellowship. An individual who is comfortable with that and comes as a strategic learner, can make a real difference. What makes Tulsa unique both professionally and for those looking to make a life there? Young professionals in Tulsa are able to identify and collaborate with and hang out with other young professionals doing exciting work in a relatively intimate environment. There are a lot of young people doing a lot of good stuff in places like Boston, but I find it can be harder to connect with people doing great work in those types of larger cities. It sometimes feels like it’s more about who you know and the inroads you make. 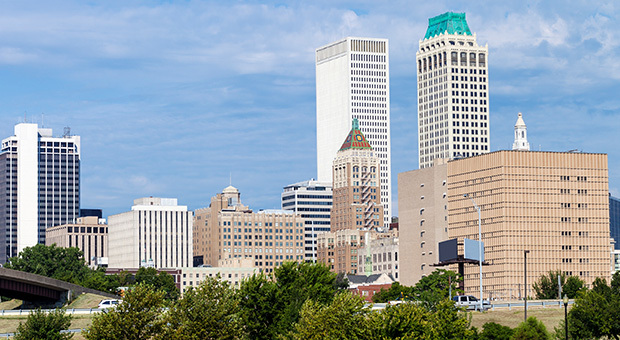 Tulsa is a small city with specific talent centers and loads of opportunities. Great places to connect are Tulsa Young Professionals and the entrepreneurship Incubator 36 Degrees North. From a personal side, young professionals will enjoy a low cost of living. If you live and work in Tulsa, you are able to make a decent salary and have a cost of living that is far lower than most cities that have similar opportunities for fun and entertainment. And there are lots of opportunities for fun and entertainment. Tulsa has world-class art, lots to do after work and on the weekends, and music is big here—without the New York or Chicago prices. Also, in January 2018, Tulsa is slated to get a 100-acre park—the largest private gift to a public park in U.S. history. The park is a gift from the George Kaiser Family Foundation. What are your favorite spots in Tulsa? Though I’ve never had a cup of coffee in my life, I appreciate how much other people love great coffee spots. There is a neat spot downtown called Chimera, which is a great place to meet young entrepreneurs who work across the street at 36 Degrees North. I love that Tulsa has a bustling arts district with a number of museums. My favorite is the Woody Guthrie Center, dedicated to the life and music of the folksinger. There is also a Bob Dylan archive that is supposed to open soon. The Dust Bowl in the Blue Dome district is an all-original, 1960’s alley with great tater tots. It’s packed on the weekends with music and dancing. And then, the Bull in the Alley is a popular speakeasy downtown. It doesn’t have a sign. It’s in an alley with a green door that has a bull above it. Make reservations!What advice would you give Fellows coming to Tulsa? My best advice is to connect with individuals here. Tulsa is a friendly city with southern hospitality. If you connect with people, they will say, “don’t hesitate to reach out” and they really, truly mean it. Take advantage of that. Don’t take months to figure out what to do and see and where to hang out. From a professional perspective, my advice is to be confident. Commit to making decisions and rapid change in an organization.